Sergio Morales, says his wife, Miriam, isn’t the jealous type. And that’s a good thing because there’s another ?woman? in his life: His beloved 1946 Harley-Davidson motorcycle. He has kept the battered red machine running for more than three decades with little more than sweat, ingenuity and homemade spare parts. ?I take pride in keeping her alive,? he said. Morales, 58, is the dean of Cuba’s intrepid motorcycle mechanics. And he and other Harley riders go to great lengths to maintain their vintage machines despite the decades-long U.S. ban on trade with the socialist government. The Harley devotees fabricate their own parts or scavenge pieces from other motorcycles, cars, tractors, lawn mowers and even anti-tank guns. ?We do whatever it takes to keep our Harleys on the road,? said Morales, cracking open a can of Bucanero beer. Morales, a wiry man with salt-and-pepper hair and a deep voice, speaks of Harleys with the reverence usually reserved for such endangered creatures as tigers and black rhinos. These Cuban hogs, he explains, have also teetered on the brink of extinction. Before Fidel Castro took power in 1959, as many as 6,000 Harley-Davidson motorcycles rumbled across the island, he said. But now, as Cuba’s Revolution approaches its 50th anniversary, that number has dwindled to only about 100. The V-twin motorcycles could have been wiped out entirely, he said, if not for the efforts of the island’s mechanics. ?Harleys were in danger of disappearing,? Morales said. ?We are the generation that took the few remaining Harleys and put them to work. And they have paid us back for our sacrifices.? As he and other aficionados see it, Harleys in Cuba aren’t just hunks of metal. Cubans rely on them for their survival. They use them to get to work, pick up groceries and take their children to school. They ride them to weddings, they take them camping. ?In the world of Harleys outside Cuba, many people ride Harleys to rallies, parties or motorcycle exhibits,? Morales said. But here ?they are part of the family.? He and other Harley riders in Cuba call themselves Harlistas. Their ranks include Ernesto Guevara, son of the late revolutionary known as Che. The Harlistas say they try to stay out of politics, but sometimes that?s impossible. In 2005, the Harlistas received an official notice telling them they couldn?t take part in Havana’s annual carnival parade because their motorcycles ?represented an American symbol,? the French news service Agence France Presse reported. The Harlistas say they aren’t counter-revolutionaries. They aren?t trying to make a statement. Nor are they bandits or criminals. They just like to ride their hogs. And foreigners who have met them say they’re impressed. ?I have been around motorcycles and motorcyclists for over 40 years and the Cuban motorcyclists are authentic bikers,? said Richard Snowden, 61, who has led motorcycle tours in Cuba. On weekends in Havana, the Harlistas often gather near the 78-year-old Hotel Nacional, which has a sweeping view of the Atlantic Ocean. Or they cruise along the Malec?n seawall as Cubans flash thumbs-up signs. Some outsiders might find it strange that Harley-Davidson, once dubbed ?America’s Greatest Freedom Machine,? has such a loyal following in socialist Cuba. But Morales said it’s only natural. Harley-Davidson has a long tradition on the island. The best known dealership was Casa Breto in the Centro Habana section of Havana, according to travel writer Tom Miller, author of ?Trading with the Enemy: A Yankee Travels Through Castro’s Cuba.? Cuban police and soldiers rode Harleys before the Revolution. So did telephone and electric company workers. The Breto dealership closed in the early 1960s, cutting off the supply of motorcycles and parts, Miller said. And Harleys began to fade away. As one tale goes, Castro revolutionaries wanted to rid the country of Harleys, linked to both American ?Yankees? and the Fulgencio Batista government they overthrew. So they dumped hundreds of Harleys into a big hole and buried them. At least that’s what the legend says. Morales said no one really knows what happened. ?We weren’t there when the Harleys disappeared,? he said. ?We can’t say if they were buried, if they were burned. But we can say that many people who could have salvaged the Harleys didn’t save them because it was easier to abandon them. It was easier than trying to keep them alive.? In the 1960s and ?70s, many Cubans started riding newer, lighter motorcycles imported from the former Soviet Union, Germany and other countries. One popular motorcycle was the German-made MZ, short for Motorradwerk Zschopau. But Morales said Harlistas refused to switch to the MZ. ?We’re passionate about four-stroke engines,? he said. ?The MZ has a two-stroke motor. It can?t keep up with us. Harley has a strong motor, a motor with a very particular sound.? But it’s not just the throaty roar that comes from the exhaust. ?Other motorcycles just don?t have the quality of an old twin-cylinder Harley,? explained Morales, who refers to his motorcycle as ?she,? not ?it.? ?A Harley’s motor can be repaired and its life extended for as long as you want,? he said. ?I think a Harley could last more than 100 years. If a man is capable of following her for that long, she’ll repay him for what he gave her.? Morales once cut a perfectly good Harley exhaust system in half just to see how it worked. He said his fascination with Harleys began in the 1970s. He got his first Harley, a model known as a flathead, and worked as an apprentice under a revered mechanic named Jose ?Pepe Mil?sima? Lorenzo. Lorenzo, who died in 1990, was both demanding and meticulous. His nickname warns of that. Mil?sima means one-thousandth, a reference to his quest for mechanical perfection. Harlistas honor Mil?sima every Father’s Day, the day of his death. They ride to Havana’s Colon Cemetery, gather around a tomb marked, ?Pepe Mil?sima, Harley-Davidson mechanic? and they rev their engines in a show of respect. 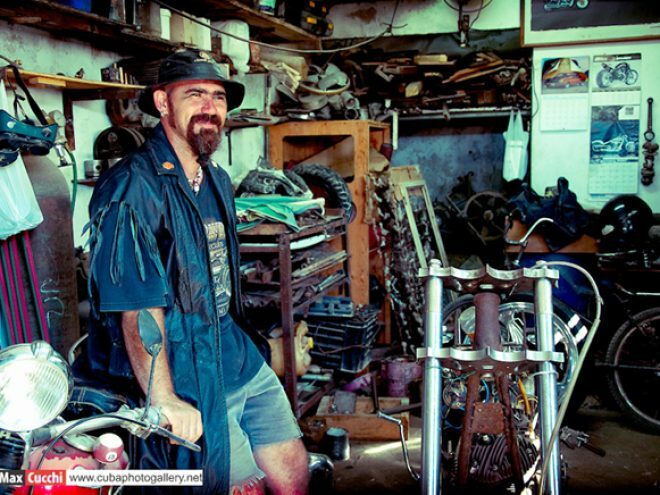 With Mil?sima gone, Morales rose to master mechanic and runs a garage dedicated to repairing old Harleys. Maintaining the motorcycles without a reliable supply of spare parts has been a daunting task, he said. In the 1970s, riders had particular trouble finding tires. So they used tires from Indian motorcycles, BMW cars and even old Soviet 37 mm anti-tank guns. That doesn’t mean the tires fit–they had to cut and pound them into place. Harlistas have also had trouble finding pistons, rings, brakes, sprockets, rims, leather seats and everything else. But they have kept their machines going, even if it means resorting to Czech brake pads or clutches from lawn mowers. ?That’s how we’ve survived, inventing, creating, looking for alternatives so that the Harleys don’t stop running,? Morales said. ?And we’ve done it–they haven’t stopped running.? The Harlistas say the struggle to maintain their motorcycles has drawn them close together. ?When a motorcycle breaks down, that’s the kind of thing that makes a friendship,? Morales said. ?We stop, we help each other out. One of us might not have a bolt, but he?ll have a washer. Another might not have a washer, but he’ll have a spark plug.? Then sometimes no one has any spare parts and the riders have to improvise. One day, a Harlista?s motorcycle was stuck with a broken chain on the way to Santa Clara in central Cuba. ?No one had a chain and no one had a link,? Morales said. ?So we walked over to a fence, cut a piece of barbed wire, made a link and we made it to Santa Clara.? Morales sipped his beer and lit a cigarette. Riders who have shiny, modern motorcycles that never break down might not understand, he said. ?When we?re out on the highway, we enjoy the mechanical part, the challenge of keeping our motorcycles going,? Morales said. ?Motorcycles give us a kind of friendship we might not find anywhere else. I don?t think writers, philosophers, laborers or lawyers have the tight friendship we have. The friendship between us is clean. It?s genuine. ?